One of the songs that Page had such unwavering belief in was called ‘Broken Wings’. The song came about through one of those moments of inspiration that creative people apparently experience, where the planets align and the portal to artistic brilliance is opened. Mr. Mister’s song writing team of Page, George and John Lang were hanging out at Page’s house one day. They started playing about with some patterns on a drum machine and Page started up a bass line that sounded pretty good, and about twenty minutes later ‘Broken Wings’ had taken shape. Like any good musician, they had a tape machine running to capture the moment of inspiration. 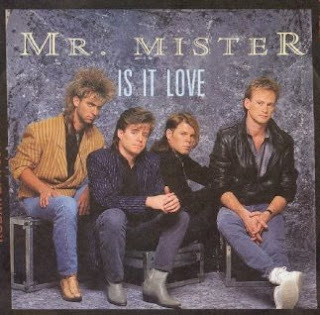 The song was included on a three track demo tape that Mr. Mister presented to the suits at RCA with a view to getting the go ahead to produce their own work for the next album. 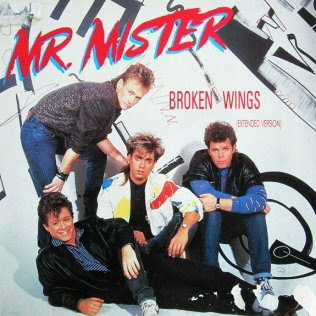 RCA agreed to let Mr. Mister co-produce the next album but didn’t view ‘Broken Wings’ as the best choice for the lead out single. RCA pushed for a more up tempo rock number, but the band were committed to getting ‘Broken Wings’ out of the studio nest as soon as possible. They’d learned from the mistakes of their first album, and this time wanted to go with what felt right. ‘Broken Wings’ took flight on the U.S. charts in September ‘85 and made a steady climb towards the chart stratosphere. The atmospheric soft rock number finally reached the summit of the U.S. Hot 100 on December 7th 1985, replacing ‘Separate Lives’ by Phil Collins and Marilyn Martin (see earlier post). It held altitude for two weeks before being replaced by Lionel Richie’s ‘Say You, Say Me’. If you’re one for useless trivia, and let’s face it who isn’t, ‘Broken Wings’ reached #1 in America exactly ten years to the week after Silver Convention did with ‘Fly, Robin, Fly’, and exactly twenty years after The Byrds hit #1 with ‘Turn! Turn! Turn!’ - one for all you bird watchers out there. As ‘Broken Wings’ sat atop the U.S. charts, it also took off in both Australia and Britain. The song followed an almost identical flight path in both countries, and went on to peak at #4 in early ‘85. Shortly after ‘Broken Wings’ peaked on the charts, jazz legend Miles Davis recorded his own version of the song, and if that’s not an endorsement of the song’s quality then I don’t know what is. Most music artists don’t manage to capture lightning in a bottle once, let alone twice, as it seemed Mr. Mister had managed to do when they released their next single ‘Kyrie’. The band had penned the song over a year previous, whilst on tour with Adam Ant - odd touring combination there. Apparently Richard Page originally thought Kyrie was Latin, but he was later informed it was Greek in origin. The lyric “Kyrie eleison” translates as “Lord have mercy”, and Page explained there was a strong element of spirituality within the song. 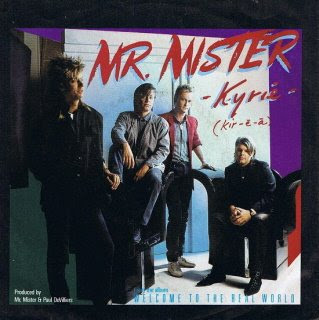 Mr. Mister’s prayers were answered when ‘Kyrie’ debuted on the U.S. charts as ‘Broken Wings’ was still sitting at the top. By the first week of March ‘Kyrie’ had shot to #1, and like its predecessor, held of the competition for two weeks. It was supplanted with ‘Sara’ by Starship, which in turn gave way to ‘These Dreams’ by Heart, proving just how dominant the soft rock power ballad was at the time, at least in the U.S. Curiously the chart performance in Australia and Britain for ‘Kyrie’, like ‘Broken Wings’, was remarkably similar. The song debuted during March ‘86 and went on to peak at #11 on the charts in both countries. 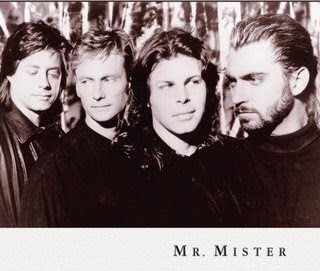 I recall seeing Mr. Mister make a special appearance on the Countdown Music & Video Awards show for that year. From memory Richard Page performed a live vocal over the instrument track for ‘Kyrie’ and did a pretty fair job, and like so many of the time, the members of Mr. Mister were attired in duster coats. 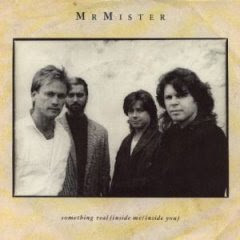 Speaking of awards, Mr. Mister received a Grammy nomination for ‘Best Pop Band’, but lost out to U.S.A. For Africa (what chance did they have against that line-up). The source album for both U.S. chart toppers was titled ‘Welcome To The Real World’. It racked up multi-platinum sales across the world, peaking at #17 in Australia, #6 in Britain and #1 in the United States. 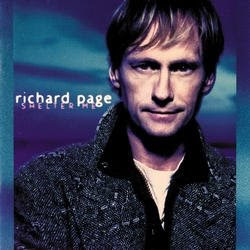 Richard Page’s conviction to stay with Mr. Mister appeared well founded. ‘Is It Love’ became the band’s third consecutive U.S. top 10 hit (#8/OZ#91), but it was to be their last major hit. After such a monumentally successful period, which also saw them tour with Don Henley, and Tina Turner, Mr. Mister faced the challenge of maintaining the impeccably high standards on their next album. Matters were complicated, and delayed, by drummer Pat Mastelotto experiencing some serious back problems during that period. The song writing team of Page, George and Lang came up with a cache of material, but then Lang departed the scene to return to graduate studies in New York. Mr. Mister’s third album ‘Go On’ was finally released in the second half of 1987. The lead out single ‘Something Real (Inside Me/Inside You)’ (US#29) was a better than average song and was featured in the hit TV show ‘Miami Vice’, but it was no ‘Broken Wings’. Soon after the album ‘Go On’ hit the stores, but without a major hit single to fuel interest, the album languished in the lower reaches of the charts (US#55/OZ#67). The second single released was ‘Healing Waters’. 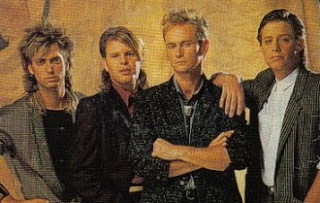 Though it was only released in Europe, ‘Healing Waters’ still garnered a Grammy Award nomination for ‘Best Gospel Performance - Duo or Group’, an indicator that Mr. Mister were exploring new ground musically. The other stand out track from ‘Go On’ was ‘Stand And Deliver’, which ended up being included in the feature film of the same name, starring Edward James Olmos (it’s a good film just quietly). 1988 witnessed the first crack’s in Mr. Mister’s previously solid unit. Richard Page and Steve Farris had a falling out, which led to Farris departing from the group in July ‘88. Farris went on to be a much in demand session/touring player, and worked with the likes of Tori Amos, Whitesnake, 4 Non Blondes, and during 1998 he toured with a reformed Player (see two posts previous). Farris’ exit left a void in Mr. Mister’s line-up that they found difficult to fill. During subsequent recording sessions for their proposed fourth album, guitarists Trevor Rabin and Buzzy Feiten were both used, but as things turned out the album ‘Pull’ was indeed pulled from release by RCA, who at the time were conducting a thorough purge of their recording roster. Mr. Mister, who were darlings of the labels execs just two years previous, found themselves uncere- moniously dumped. They attempted to get label backing for ‘Pull’ elsewhere, but word was the album was considered to prog-rock, and in the late 80s prog-rock was a difficult brand of music to sell. 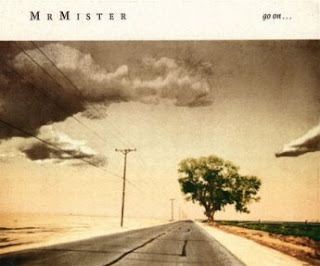 With no label, and no prospect of commercial backing, Mr. Mister pulled the plug before the end of 1989. With two U.S. #1 singles behind them and years of session work, Page, George and Mastelotto had no problem landing work elsewhere. Mastelotto played in studio with XTC and joined veteran prog-rock outfit King Crimson in 1994. Page continued writing for other artists and in 1994 penned Madonna’s US#2 hit ‘I’ll Remember’. That led Page to forming the group Third Matinee with Madonna’s producer Patrick Leonard. Page then released his debut solo album ‘Shelter Me’ in 1996, before moving on to work on Disney musicals. One time Mr. Mister lyricist John Lang, finally gave the performance side of music a go when he formed the post-grunge band Djinn in the mid 90s. Keyboardist Steve George worked with Kenny Loggins, as Loggins’ music director for most of the 90s, before going on to work as a touring player with Jewel.